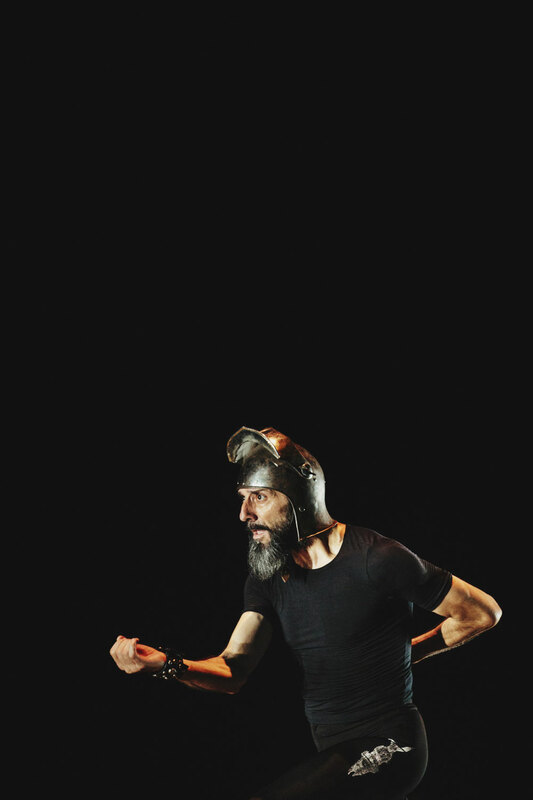 First of all, I have to tell you that the idea was to have talked only about Don Quixote, the much-anticipated project of Andrés Marín who came to Seville on Sunday to a Maestranza theater that was again nearly empty. But after these ten intense days of the Bienal, certain questions I need to share with you. I suppose this is another of the functions of art, to interrogate and provoke reflection. So I hope you will forgive the license taken. Nevertheless, I’m sure you’ll find interesting articles that praise the genius of the artist, and others that criticize the lack of depth. 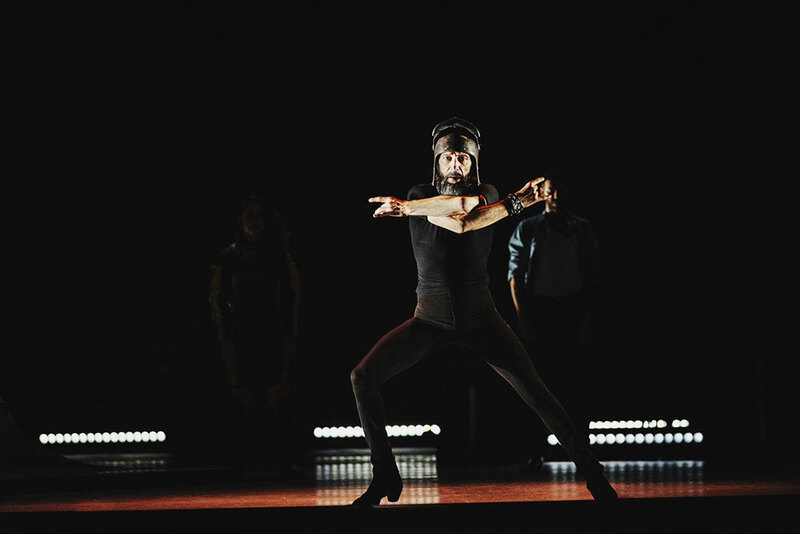 The thing is, this work, whose image with the dancer wearing boxing gloves and a knight’s helmet, was chosen to advertise the season at the Teatro Chaillot in Paris where it debuted, is presented as a super-production that revives and redoes the Cervantes character from an urban and contemporary perspective. In this prism, the Seville dancer sketches metaphors on the capacity, or lack of same, of dreams to change the world, the reigning conventionalisms, the alienation in which we live, the function of art and the struggle to find oneself. 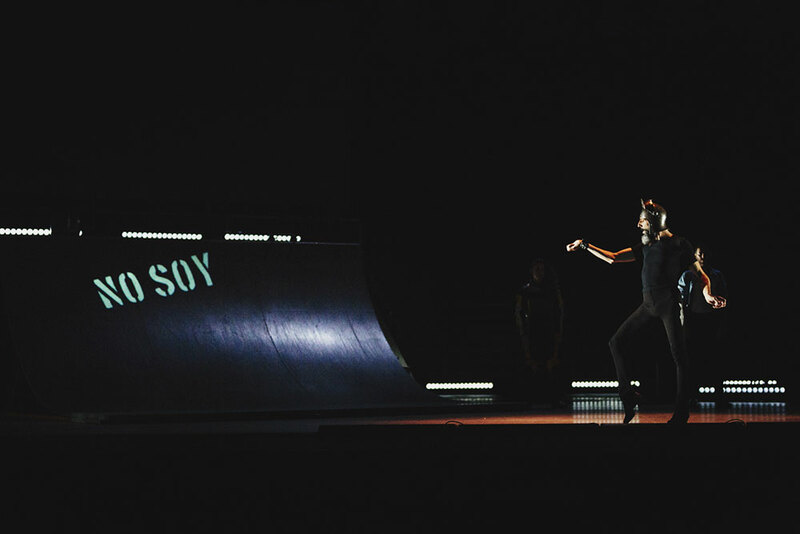 Using for the purpose a full range of stage resources, from giant screens (with projected texts containing unforgivable spelling mistakes), a skating rink, neon lights and an electric skateboard. And here’s my first question: ¿when does the dancing begin? 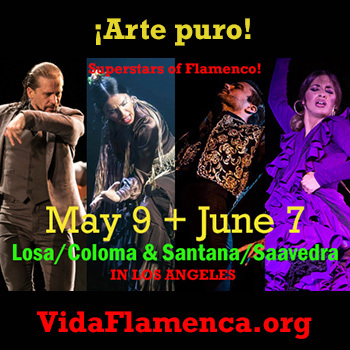 Because aside from the superb musical work of percussionist Daniel Suárez, cellist Sancho Almendral, the theorbo and electric guitar of Jorge Rubiales and the singing of Rosario la Tremendita, the actual guiding thread of the work, what Marín offers are scenes, experimental pieces that contain little or no dancing. In other words, of course we find certain ideas interesting, the camera inside the tent for example, and images that reflect the fertile creative universe of this artist (his transformation into a bull with flaming horns, the three-way choreographies with Patricia Guerrero and Abel Arana, the humorous numbers…). But the things this ingenious knight dreams up, and the technical level, end up devouring his dancing, always stop-and-start, with the whole thing becoming monotonous, boring and lacking in emotion. Of course at the exit, there was only praise from European flamenco followers, and aside from Andrés Marín, I wondered the following: is “euro-zone” flamenco becoming the standard? I honestly believe, and it shows in this Bienal more than ever, that the artists are gearing their work to make it appropriate for European circuits, where tastes and demands are others (which would explain as well the diminished interest in flamenco singing and the obsession with theatrics). Logically, I would think, because better conditions are offered than in Spain, something that is painful to contemplate. 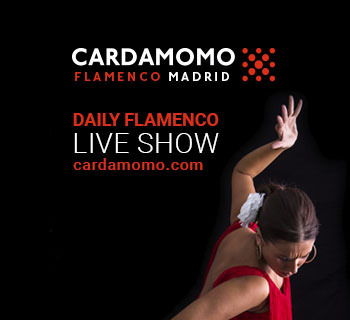 Most of all because if flamenco creativity is only at the service of audiences that demand other tendencies, are we not losing part of its character and context? That which, on the other had, is what attracted them to flamenco in the first place. I don’t know, well, okay, Seville isn’t Paris…unfortunately and also fortunately. Between one thing and another, and with these thoughts in my head, I went to see María Terremoto and began to suffer with unbearable deafening sound that hurt my ears. It’s outrageous we have to hear repeatedly from the audience people shouting out to turn down the volume. The young singer came off poorly for the presentation of her first recording, with so much echo effect that it was impossible to enjoy the true sound of her voice (which is already impetuous on its own), and with a show that relied more on songs with choruses and an excess of accompaniment (four people to keep rhythm, one cajon and two guitars), than on the depth of her singing. It was a night of indignation and frustration. As far as the Bienal kidding us all regarding the refitting of the Teatro Alameda as a café cantante, I’ll tell you about it next time.